Another great addition to our classic series. Estes has gone back to the archives, pulled up old drawings and spec sheets and brought these fantastic flying machines back for old and new rocketeers to enjoy. This kit has been reproduced and updated while still retaining the classic lines of the original. The Chuter-Two kit contains our high quality body tubes, wood nose cones and laser cut wood fins. Unless otherwise specified, all models require assembly. Tools, construction and finishing supplies sold separately. 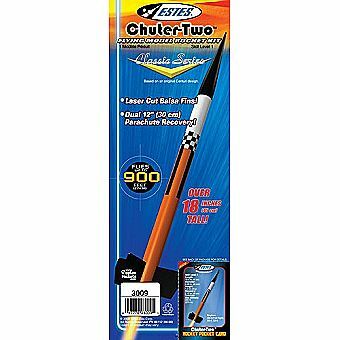 In order to launch, a launch system, 3/16" Maxi Launch Rod, model rocket engines, igniters and recovery wadding are required - sold separately-unless otherwise specified.